I love paper piecing. It's the method I use to embellish the hoodies in my shop--among other things. I started with the hexagons but have since fallen in love with the stars--though the 8 pointed ones take *forever*! The colors here are lovely. I think the best part may be combining different fabrics. I think it looks stunning. It's so airy and beautiful...I love it. Thanks, everyone! I think I should have spent more time picking out the fabrics. I don't even see the three florals; the green dots take over! Of course, all my parents could say was that I had spent "too much time" making the pillow. Sigh. You've done a great job!! And I like your fabrics just fine, too. As for spending "too much time"- well, this is about enjoying the process as well as the product. Well done!! I love the result! It's beautiful and peaceful. Enjoy. 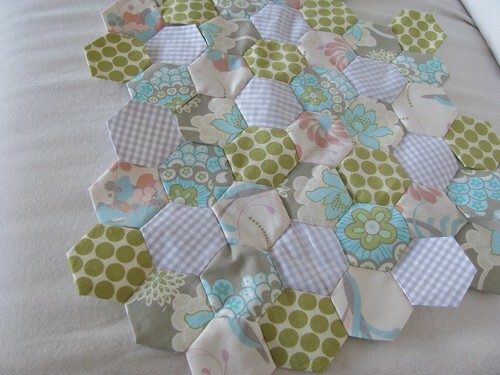 English Paper Piecing is one of my most favorite methods! Ah, this is the type of quilting that my Grandma used to do. I would love to learn myself but I don't think I have the attention span for it - you never know until you try, right?